The NSW Blues have won the 2015 Matador Cup after defeating South Australian Red Backs by 9 wickets at North Sydney Oval. Steve O’Keefe and Mitchell Starc were instru mental in helping the Blues win their first Domestic One Day title in the last ten years. After a great collective effort from the bowling group with Hazelwood (3-28), Starc (3-39) and Abbott, Lyon and O’keefe all chipping in with wickets, the Blues were able to bowl South Australia out in 46.3 overs for a well below par score of 221. Nic Maddinson got the Blues off to a flyer after scoring 44 off 29 before Cowan (88 not out) and Smith (84 not out) chasing down then remainder of the runs with ease to pass the Redbacks total in 29.5 overs. Steve O’Keefe performed strongly taking 8 wickets at 27 for the series and scoring 58 runs at 29. Mitchell Starc was simply outstanding – the 196cm left-armer captured 26 wickets at the amazing average of 8 and strike rate of 12.2. This was not a surprise to many given Mitchell’s incredible form this year, highlighted by him winning Player of the Tournament in Australia’s victorious World Cup campaign. 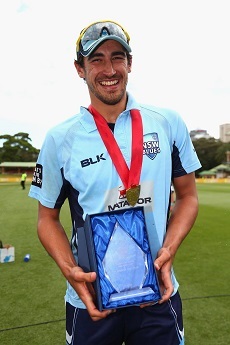 Mitchell finished the Matador Cup as Player of the Tournament and is now also the record holder for the most wickets in an Australian One Day Domestic Season. The Blues play the Red Backs again on Wednesday in the first round of the Sheffield Shield at Adelaide Oval. This is followed by the commencent of the Australian Test teams series against NZ beginning on November 5 at Brisbane.